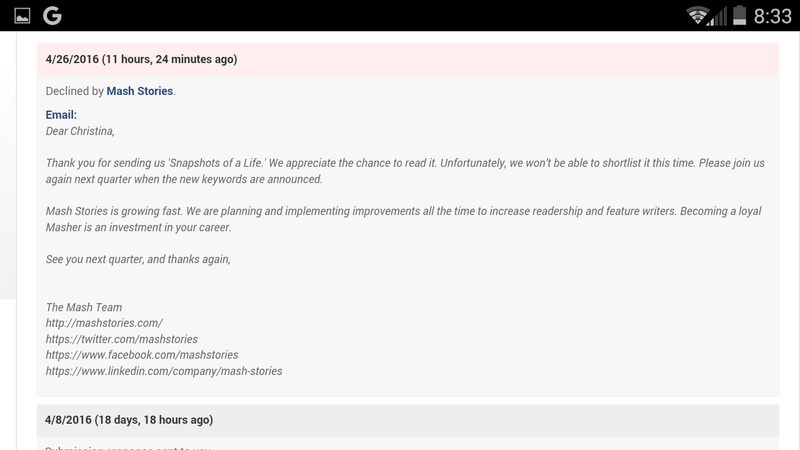 I am very appreciative of the feedback I received on my story “Snapshots of a Life” from Mash Stories. If you get a chance I would definitely submit to them. I love getting feedback on my stories, because it helps me improve my writing. I think there is nothing more frustrating than getting no feedback at all. I am going to be submitting more stories to them. So I’m just gonna leave this here…. 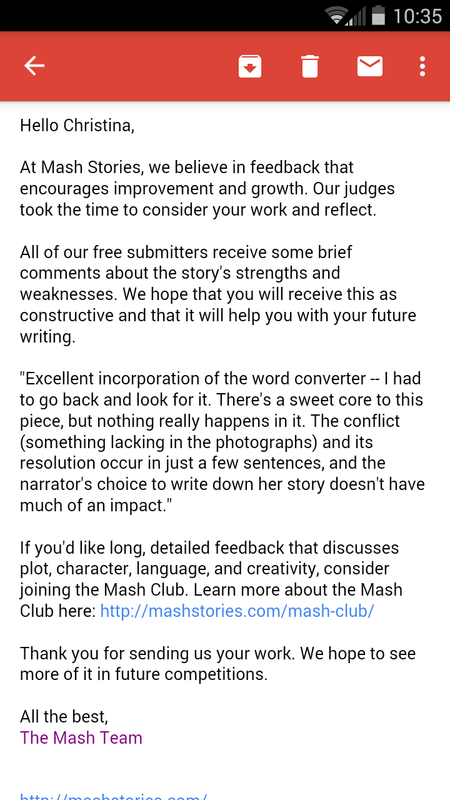 Second rejection letter, from Mash Stories. I had submitted this story to the writing competition they hosted on the 8th of this month. I just got an email and got this on my submittable account. Unfortunately as with other stories that I have submitted previously, I have gotten no feedback. I find that frustrating. The story I wrote for this Mash stories was a stepping stone for changing the name on my blog page to Snapshots of a Life, and it is a story I hold dear because it is based on a simple truth. So moving on from here… I look forward to sharing this story on my page, with all of you later tonight. I think that is where it belongs. I am continuing to move forward with my novel I am writing, as well as reading The Story Sisters, by Alice Hoffman. I have not been able to put it down! After I finish it I will also be writing a review for all of you. I feel reading is a big part of writing. You cannot write unless you read. It gives you such an appreciation of the craft, and also ways on which we can improve our writing. 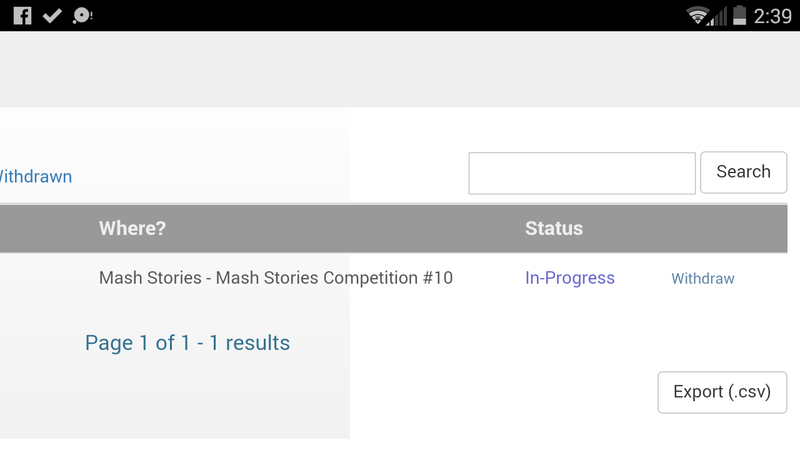 Does anyone get excited and or nervous when you see your story is in progress on submittable? Because I am. I have been watching submittable like a hawk, hoping that the little submission status would change. Waiting to see if my work has been accepted is very hard for me because I am an impatient person! Anyone have this problem too? Obsessively checking your submission status on submittable? I just entered this competition. This is a great way to improve your writing skills. I also enjoy reading the shortlisted stories on their website. I love reading as much as I love to write!